For other uses, see Kite (disambiguation). Yokaichi Giant Kite Festival is held every May in Higashiomi, Shiga, Japan. Some kites flying in the park. Star-shaped kite above a meadow south of Hockenheim. This sparless, ram-air inflated kite, has a complex bridle formed of many strings attached to the face of the wing. A kite is a tethered heavier-than-air craft with wing surfaces that react against the air to create lift and drag. A kite consists of wings, tethers and anchors. Kites often have a bridle and tail to guide the face of the kite so the wind can lift it. Some kite designs don’t need a bridle; box kites can have a single attachment point. A kite may have fixed or moving anchors that can balance the kite. One technical definition is that a kite is “a collection of tether-coupled wing sets“. The lift that sustains the kite in flight is generated when air moves around the kite's surface, producing low pressure above and high pressure below the wings. The interaction with the wind also generates horizontal drag along the direction of the wind. The resultant force vector from the lift and drag force components is opposed by the tension of one or more of the lines or tethers to which the kite is attached. The anchor point of the kite line may be static or moving (e.g., the towing of a kite by a running person, boat, free-falling anchors as in paragliders and fugitive parakites or vehicle). The same principles of fluid flow apply in liquids, so kites can be used in underwater currents, but there are no everyday uses as yet. Man-lifting kites were made for reconnaissance, entertainment and during development of the first practical aircraft, the biplane. Kites have a long and varied history and many different types are flown individually and at festivals worldwide. Kites may be flown for recreation, art or other practical uses. Sport kites can be flown in aerial ballet, sometimes as part of a competition. Power kites are multi-line steerable kites designed to generate large forces which can be used to power activities such as kite surfing, kite landboarding, kite fishing, kite buggying and snow kiting. Kites were invented in Asia, though their exact origin can only be speculated. Many early sources point to China. In China, materials ideal for kite building were readily available including silk fabric for sail material; fine, high-tensile-strength silk for flying line; and resilient bamboo for a strong, lightweight framework. The kite has been claimed as the invention of the 5th-century BC Chinese philosophers Mozi (also Mo Di, or Mo Ti) and Lu Ban (also Gongshu Ban, or Kungshu Phan). By 549 AD paper kites were certainly being flown, as it was recorded that in that year a paper kite was used as a message for a rescue mission. Ancient and medieval Chinese sources describe kites being used for measuring distances, testing the wind, lifting men, signaling, and communication for military operations. The earliest known Chinese kites were flat (not bowed) and often rectangular. Later, tailless kites incorporated a stabilizing bowline. Kites were decorated with mythological motifs and legendary figures; some were fitted with strings and whistles to make musical sounds while flying. After its introduction into India, the kite further evolved into the fighter kite, known as the patang in India, where thousands are flown every year on festivals such as Makar Sankranti. Kites were known throughout Polynesia, as far as New Zealand, with the assumption being that the knowledge diffused from China along with the people. Anthropomorphic kites made from cloth and wood were used in religious ceremonies to send prayers to the gods. Polynesian kite traditions are used by anthropologists to get an idea of early "primitive" Asian traditions that are believed to have at one time existed in Asia. Kites were late to arrive in Europe, although windsock-like banners were known and used by the Romans. Stories of kites were first brought to Europe by Marco Polo towards the end of the 13th century, and kites were brought back by sailors from Japan and Malaysia in the 16th and 17th centuries. 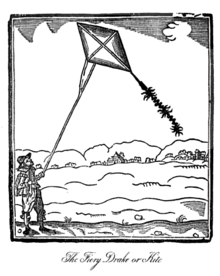 Konrad Kyeser described dragon kites in Bellifortis about 1400 AD. Although kites were initially regarded as mere curiosities, by the 18th and 19th centuries they were being used as vehicles for scientific research. In 1752 Benjamin Franklin published an account of a kite experiment to prove that lightning was caused by electricity. Kites were also instrumental in the research of the Wright brothers, and others, as they developed the first airplane in the late 1800s. Several different designs of man-lifting kites were developed. The period from 1860 to about 1910 became the "golden age of kiting". In the 20th century many new kite designs were developed. These included Eddy's tailless diamond, the tetrahedral kite, the Rogallo wing, the sled kite, the parafoil, and power kites. Kites were used for scientific purposes, especially in meteorology, aeronautics, wireless communications and photography. The Rogallo wing was adapted for stunt kites and hang gliding and the parafoil was adapted for parachuting and paragliding. The rapid development of mechanically powered aircraft diminished interest in kites. World War II saw a limited use of kites for military purposes (survival radio, Focke Achgelis Fa 330, military radio antenna kites). Kites are now mostly used for recreation. Lightweight synthetic materials (ripstop nylon, plastic film, carbon fiber tube and rod) are used for kite making. Synthetic rope and cord (nylon, polyethylene, kevlar and dyneema) are used as bridle and kite line. Designs often emulate flying insects, birds, and other beasts, both real and mythical. The finest Chinese kites are made from split bamboo (usually golden bamboo), covered with silk, and hand painted. On larger kites, clever hinges and latches allow the kite to be disassembled and compactly folded for storage or transport. Cheaper mass-produced kites are often made from printed polyester rather than silk. Tails are used for some single-line kite designs to keep the kite's nose pointing into the wind. Spinners and spinsocks can be attached to the flying line for visual effect. There are rotating wind socks which spin like a turbine. On large display kites these tails, spinners and spinsocks can be 50 feet (15 m) long or more. Modern aerobatic kites use two or four lines to allow fine control of the kite's angle to the wind. Traction kites may have an additional line to de-power the kite and quick-release mechanisms to disengage flyer and kite in an emergency. Kites have been used for human flight, military applications, science and meteorology, photography, lifting radio antennas, generating power, aerodynamics experiments, and much more. Kites have been used for military purposes in the past, such as signaling, delivery of munitions, and for observation, both by lifting an observer above the field of battle and by using kite aerial photography. Kites were first used in warfare by the Chinese. During the Song dynasty the Fire Crow, a kite carrying incendiary powder, a fuse, and a burning stick of incense was developed as a weapon. According to Samguk Sagi, in 647 Kim Yu-sin, a Korean general of Silla rallied his troops to defeat rebels by using flaming kites which also scared the enemy. Russian chronicles mention Prince Oleg of Novgorod use of kites during the siege of Constantinople in 906: "and he crafted horses and men of paper, armed and gilded, and lifted them into the air over the city; the Greeks saw them and feared them". Walter de Milemete's 1326 De nobilitatibus, sapientiis, et prudentiis regum treatise depicts a group of knights flying kite laden with a black-powder filled firebomb over the wall of city. Kites were also used by Admiral Yi of the Joseon Dynasty (1392–1910) of Korea. During the Japanese invasions of Korea (1592–1598), Admiral Yi commanded his navy using kites. His kites had specific markings directing his fleet to perform various orders. 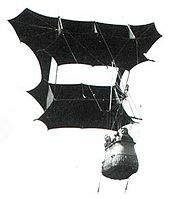 In the modern era the British Army used kites to haul human lookouts into the air for observation purposes, using the kites developed by Samuel Franklin Cody. Barrage kites were used to protect shipping during the Second World War. Kites were also used for anti-aircraft target practice. Kites and kytoons were used for lofting communications antenna. Submarines lofted observers in rotary kites. Palestinians from the Gaza Strip have flown firebomb kites over the Israel–Gaza barrier, setting fires on the Israeli side of the border, hundreds of dunams of Israeli crop fields were burned by firebomb kites launched from Gaza, with an estimated economic loss of several millions of shekels. Kites have been used for scientific purposes, such as Benjamin Franklin's famous experiment proving that lightning is electricity. Kites were the precursors to the traditional aircraft, and were instrumental in the development of early flying craft. Alexander Graham Bell experimented with very large man-lifting kites, as did the Wright brothers and Lawrence Hargrave. Kites had a historical role in lifting scientific instruments to measure atmospheric conditions for weather forecasting. Francis Ronalds and William Radcliffe Birt described a very stable kite at Kew Observatory as early as 1847 that was trialled for the purpose of supporting self-registering meteorological instruments at height. Kites can be used for radio purposes, by kites carrying antennas for MF, LF or VLF-transmitters. This method was used for the reception station of the first transatlantic transmission by Marconi. Captive balloons may be more convenient for such experiments, because kite-carried antennas require a lot of wind, which may be not always possible with heavy equipment and a ground conductor. It must be taken into account during experiments, that a conductor carried by a kite can lead to high voltage toward ground, which can endanger people and equipment, if suitable precautions (grounding through resistors or a parallel resonant circuit tuned to transmission frequency) are not taken. Kites can be used to pull people and vehicles downwind. Efficient foil-type kites such as power kites can also be used to sail upwind under the same principles as used by other sailing craft, provided that lateral forces on the ground or in the water are redirected as with the keels, center boards, wheels and ice blades of traditional sailing craft. In the last two decades several kite sailing sports have become popular, such as kite buggying, kite landboarding, kite boating and kite surfing. Snow kiting has also become popular in recent years. Underwater kites are being developed to harvest renewable power from the flow of water. Kite festivals are a popular form of entertainment throughout the world. They include large local events, traditional festivals which have been held for hundreds[clarification needed] of years and major international festivals which bring in kite flyers from other countries to display their unique art kites and demonstrate the latest technical kites. Many countries have kite museums. These museums may have a focus on historical kites, preserving the country’s kite traditions. Kite flying is popular in many Asian countries, where it often takes the form of "kite fighting", in which participants try to snag each other's kites or cut other kites down. Fighter kites are usually small, flat, flattened diamond-shaped kites made of paper and bamboo. Tails are not used on fighter kites so that agility and maneuverability are not compromised. In Afghanistan, kite flying is a popular game, and is known in Dari as Gudiparan Bazi. Some kite fighters pass their strings through a mixture of ground glass powder and glue, which is legal. The resulting strings are very abrasive and can sever the competitor's strings more easily. The abrasive strings can also injure people. During the Taliban rule in Afghanistan, kite flying was banned, among various other recreations. In Pakistan, kite flying is often known as Gudi-Bazi or Patang-bazi. Although kite flying is a popular ritual for the celebration of spring festival known as Jashn-e-Baharaan (lit. Spring Festival) or Basant, kites are flown throughout the year. Kite fighting is a very popular pastime all around Pakistan, but mostly in urban centers across the country (especially Lahore). The kite fights are at their highest during the spring celebrations and the fighters enjoy competing with rivals to cut-loose the string of the others kite, this is popularly known as "Paecha". During the spring festival, kite flying competitions are held across the country and the skies are colored with kites. As people cut-loose an opponents kite, shouts of 'wo kata' ring through the air. They reclaim the kites, after they have been cut-loose, by running after them. This is a popular ritual especially among the youth (similar to scenes depicted in the Kite Runner which is based in neighboring Afghanistan). Kites and strings are a big business in the country and many types of strings are used: glass-coated strings, metal strings and tandi. However, kite flying was recently banned in Punjab due to recent motorcyclist deaths caused by glass-coated or metal kite-strings. Kup, Patang, Guda, and Nakhlaoo are some of the kites used. They vary in balance, weight and speed. In Indonesia kites is flown as both sport and recreation. One of the most popular kites variants is from Bali. Balinese kites are unique and they has different design and forms; birds, butterflies, dragons, ships, etc. In Vietnam, kites are flown without tails. Instead small flutes are attached allowing the wind to "hum" a musical tune. There are other forms of sound-making kites. In Bali, large bows are attached to the front of the kites to make a deep throbbing vibration, and in Malaysia row of gourds with sound-slots are used to create a whistle as the kite flies. Malaysia has also the Kite Museum in Malacca. Kites are very popular in India, with the states of Gujarat , Bihar, Jharkhand, West Bengal, Rajasthan and Punjab notable for their kite fighting festivals. Highly maneuverable single-string paper and bamboo kites are flown from the rooftops while using line friction in an attempt to cut each other's kite lines, either by letting the cutting line loose at high speed or by pulling the line in a fast and repeated manner. During the Indian spring festival of Makar Sankranti, near the middle of January, millions of people fly kites all over northern India. Kite flying in Hyderabad starts a month before this, but kite flying/fighting is an important part of other celebrations, including Republic Day, Independence Day, Raksha Bandhan, Viswakarma Puja day in late September and Janmashtami. An international kite festival is held every year before Uttarayan for three days in Vadodara, Surat and Ahmedabad. Kites have been flown in China since ancient times. Weifang is home to the largest kite museum in the world. It also hosts an annual international kite festival on the large salt flats south of the city. There are several kite museums in Japan, UK, Malaysia, Indonesia, Taiwan, Thailand and the USA. In the olden days, Malays in Singapore, kites were used for fishing. In Japan, kite flying is traditionally a children's play in New Year holidays and in the Boys' Festival in May. In some areas, there is a tradition to celebrate a new boy baby with a new kite (祝い凧). There are many kite festivals throughout Japan. The most famous one is "Yōkaichi Giant Kite Festival" in Higashiōmi, Shiga, which started in 1841. The largest kite ever built in the festival is 62 feet (19 m) wide by 67 feet (20 m) high and weighs 3,307 pounds (1,500 kg). In the Hamamatsu Kite Festival in Hamamatsu, Shizuoka, more than 100 kites are flown in the sky over the Nakatajima Sand Dunes, one of the three largest sand dunes in Japan, which overlooks the Enshunada Sea. The parents who had a new baby prepare a new kite with their baby's name and fly it in the festival. Those kites are traditional ones made from bamboo and paper. Making a traditional Wau jala budi kite in Malaysia. The bamboo frame is covered with plain paper and then decorated with multiple layers of shaped paper and foil. In Greece and Cyprus, flying kites is a tradition for Clean Monday, the first day of Lent. In the British Overseas Territory of Bermuda, traditional Bermuda kites are made and flown at Easter, to symbolise Christ's ascent. Bermuda kites hold the world records for altitude and duration. In Fuerteventura a kite festival is usually held on the weekend nearest to 8 November lasting for 3 days. Polynesian traditional kites are sometimes used at ceremonies and variants of traditional kites for amusement. Older pieces are kept in museums. These are treasured by the people of Polynesia. In Brazil, flying a kite is a very popular leisure activity for children, teenagers and even young adults. Mostly these are boys, and it is overwhelmingly kite fighting a game whose goal is to maneuver their own kites to cut the other persons' kites' strings during flight, and followed by kite running where participants race through the streets to take the free-drifting kites. As in other countries with similar traditions, injuries are common and motorcyclists in particular need to take precautions. In Chile, kites are very popular, especially during Independence Day festivities (September 18). In Peru, kites are also very popular. There are kite festival in parks and beache mostly on August. In Colombia, kites can be seen flown in parks and recreation areas during August which is known to be windy. It is during this month that most people, especially the young ones would fly kites. A very popular Creole pastime was the flying of kites. Easter Monday, a public holiday, was the great kite-flying day on the sea wall in Georgetown and on open lands in villages. Young and old alike, male and female, appeared to be seized by kite-flying mania. Easter 1885 serves as a good example. "The appearance of the sky all over Georgetown, but especially towards the Sea Wall, was very striking, the air being thick with kites of all shapes and sizes, covered with gaily coloured paper, all riding bravely on the strong wind. Kite flying originated as a Chinese tradition to mark the beginning of spring. However, because the plantation owners were suspicious of the planter class (read "plantation workers"), the Chinese claimed that it represented the resurrection of Jesus Christ. It was a clever argument, as at that time, Christians celebrated Easter to the glory of the risen Christ. The Chinese came to Guyana from 1853–1879. 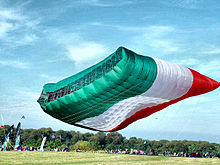 A kite in the shape of the flag of Kuwait. The size when flat is 42 by 25 meters (138 ft × 82 ft), 1,050 square meters (11,300 sq ft). While flying it becomes a little smaller (about 900 square meters (9,700 sq ft)) due to curvature of the edges when inflated. There are many world records involving kites. The world's largest kites are inflatable single-line kites. The world record for the largest kite flown for at least 20 minutes is "The Flag of Kuwait". The single-kite altitude record is held by a triangular-box delta kite. On 23 September 2014 a team led by Robert Moore, flew a 129 square feet (12 m2) kite to 16,009 feet (4,880 m) above ground level. The record altitude was reached after 8 series of attempts over a ten-year period from a remote location in western NSW, Australia. The 9.2 feet (3 m) tall and 19.6 feet (6 m) wide Dunton-Taylor delta kite's flight was controlled by a winch system using 40,682 feet (12,400 m) of ultra high strength Dyneema line. The flight took about eight hours from ground and return. The height was measured with on-board GPS telemetry transmitting positional data in real time to a ground-based computer and also back-up GPS data loggers for later analysis. The Kite Runner, a 2005 novel by Khaled Hosseini dramatizes the role of kite fighting in pre-war Kabul. The Peanuts cartoon character Charlie Brown was often depicted having flown his kite into a tree as a metaphor for life's adversities. "Let's Go Fly a Kite" is a song from the Mary Poppins film and musical. In the Disney animated film Mulan, kites are flown in the parade. In the film Shooter, a kite is used to show the wind direction and wind velocity. There are safety issues involved in kite-flying. Kite lines can strike and tangle on electrical power lines, causing power blackouts and running the risk of electrocuting the kite flier. Wet kite lines or wire can act as a conductor for static electricity and lightning when the weather is stormy. Kites with large surface area or powerful lift can lift kite fliers off the ground or drag them into other objects. In urban areas there is usually a ceiling on how high a kite can be flown, to prevent the kite and line infringing on the airspace of helicopters and light aircraft. It is also possible for fighter kites to kill people, as happened in India when three spectators were killed in separate incidents during Independence Day, August, 2016—precipitating a ban on certain types of enhanced line. Kitelife—an American magazine devoted to kites. Solar balloon A solar-heated hot air balloon that can be flown like a kite, but on windless days. ^ Eden, Maxwell (2002). The Magnificent Book of Kites: Explorations in Design, Construction, Enjoyment & Flight. 387 Park Avenue South, New York, New York 10016: Sterling Publishing Company, Inc. p. 18. ISBN 9781402700941. ^ "What is a kite? A kite is ________. Definition of "kite" in the world". ^ "Beginner's Guide to Aeronautics". NASA. Retrieved 2012-10-03. ^ Woglom, Gilbert Totten (1896). Parakites: A treatise on the making and flying of tailless kites for scientific purposes and for recreation. Putnam. OCLC 2273288. ^ "The Bachstelze Article describes the Fa-330 Rotary Wing Kite towed by its mooring to the submarine. The kite was a man-lifter modeled after the autogyro principle". Uboat.net. Retrieved 2012-10-03. ^ "Underwater kiting". 2lo.de. Retrieved 2012-10-03. ^ "Hydro kite angling device Jason C. Hubbart". Retrieved 2012-10-03. ^ Needham, Joseph (1965). Science and Civilisation in China, Vol. 4, Part II. Cambridge: Cambridge University Press. p. 576–577. ISBN 978-0521058032. ^ Sarak, Sim; Yarin, Cheang (2002). Khmer Kites. Cambodia: Ministry of Culture and Fine Arts. ASIN B005VDYAAW. ^ Kite Flying for Fun and Science, 1907, The New York Times. ^ Tripathi, Piyush Kumar (7 January 2012). "Kite fights to turn skies colourful on Makar Sankranti - Professional flyers to showcase flying skills; food lovers can relish delicacies at snack huts". The Telegraph. Calcutta, India. ^ Tarlton, John. "Ancient Maori Kites". Retrieved 19 October 2011. ^ Chadwick, Nora K. (July 1931). "The Kite: A Study in Polynesian Tradition". Journal of the Royal Anthropological Institute. 61: 455–491. doi:10.2307/2843932. ISSN 0307-3114. JSTOR 2843932. ^ Ley, Willy (December 1961). "Dragons and Hot-Air Balloons". For Your Information. Galaxy Science Fiction. pp. 79–89. ^ "History of Kites". Archived from the original on 26 April 2012. Retrieved 18 April 2012. ^ "Kites- The History Attached With It". Sporteology. 2017-12-03. Retrieved 2019-02-01. ^ "신호연신호 개요 (Summary of sending a signal with a kite)" (in Korean). Korea Culture & Contents Agency. Archived from the original on July 8, 2011. Retrieved July 30, 2009. ^ M. Robinson. "Kites On The Winds of War". Members.bellatlantic.net. Archived from the original on 2012-01-21. Retrieved 2012-10-03. ^ Saul, Trevor (August 2004). "Henry C Sauls Barrage Kite". Soul Search. Retrieved 2012-10-03. ^ Grahame, Arthur (May 1945). "Target Kite Imitates Plane's Flight". Popular Science. Retrieved 2012-10-03. ^ "World Kite Museum". World Kite Museum. Archived from the original on 2009-04-06. Retrieved 2012-10-03. ^ "Kite. (2007) Encyclopædia Britannica Online". Britannica.com. Retrieved 2013-04-22. ^ "Story of a Kite". The New Indian Express. Retrieved 2018-03-15. ^ Skeat, Walter William (1965). Malay Magic: An Introduction to the Folklore and Popular Religion of the Malay Peninsular. p. 485. ISBN 978-0-7146-2026-8. ^ "mirantesmt.com". Archived from the original on 2015-08-27. ^ Buckland, Lucy (September 4, 2011). "World's biggest kite - larger than a football pitch - fails to soar at Bristol festival". Daily Mail. London. ^ "Highest altitude by a single kite". ^ Moore, R. "Untitled Page". Look up kite in Wiktionary, the free dictionary. Wikimedia Commons has media related to Kite. The earliest depiction of kite flying in European literature in a panorama of Ternate (Moluccas) 1600. Mathematics and aeronautical principles of kites. Trivedi, Parthsarathi; et al. "Aerodynamics of Kites" (PDF). Retrieved 8 February 2013.